In our anxious society, to cite a case in point, one of the great "seductions of Pharaoh" is the fact that "soccer practice" invades the rest day. Families, largely contained in market ideology, think of themselves as helpless before the requirements of such commitment. In context it requires (or "would require," subjunctive, contrary to fact) enormous, communal resolve to resist the demand. 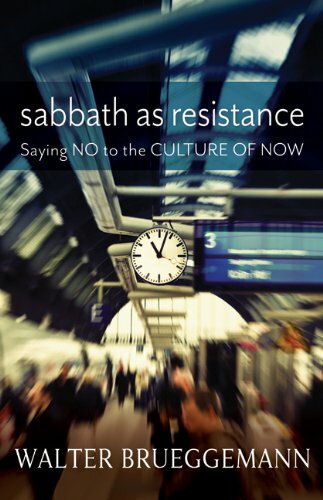 But Sabbath is not only resistance. It is alternative. It is an alternative to the demanding, chattering, pervasive presence of advertising and its great liturgical claim of professional sports that devour all our "rest time". The alternative on offer is the awareness and practice of the claim that we are situated on the receiving end of the gifts of God. Thus I have come to think that the fourth commandment on sabbath is the most difficult and most urgent of the commandments in our society, because it summons us to intent and conduct that defies the most elemental requirements of a commodity-propelled society that specializes in control and entertainment, bread and circuses... along with anxiety and violence.